Zwilling Pro 7 Piece Knife Block Set has key knives every cook needs. Pro knives from JA Henckels are durable and very sharp, making all of your cutting jobs much easier. The bolster, or base of the knife separating your hand from the blade, is angled, making it even easier to chop, dice or slice. 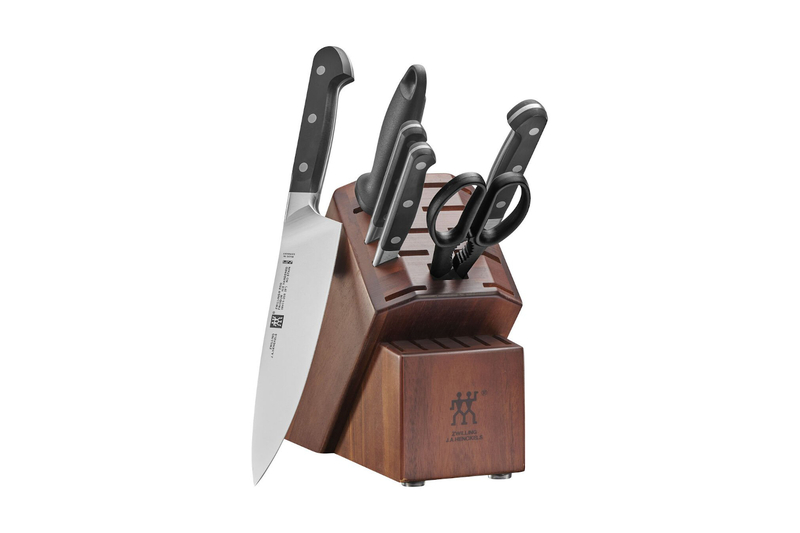 Pro knives are designed by Henckels in conjunction with Italian based architect, Matteo Thun. Every Henckels Pro knife comes with a lifetime guarantee and is made in Germany. Henckels Pro series combines the best features of German and Japanese knives. 5½ Fine Edge Prep Knife. 8 inch Traditional Chef's Knife. TWIN 9 inch Honing Steel. Precision forged using Zwilling's Sigmaforge process, resulting in a blade that is exceptionally hard yet flexible. Curved handle comfortably fits in your hand, so your grip is secure and firm. 11° blade angle provide outstanding cutting performance. Arched bolster perfectly supports your thumb. Full length of the knife edge can be sharpened, from tip to end. Triple-riveted, easy to hold contoured handle is made from germ-resistant resin. 16-slot Acacia Block Dimensions: 16¾ L x 5½ W x 9¾ H inches . Acacia Block Weight: 8 lbs. Material: High-Carbon NO STAIN steel. Lifetime Warranty with proper use and care.